MONTEBELLO >> A fugitive suspected of killing his estranged wife died in a gunfight with police Friday afternoon. 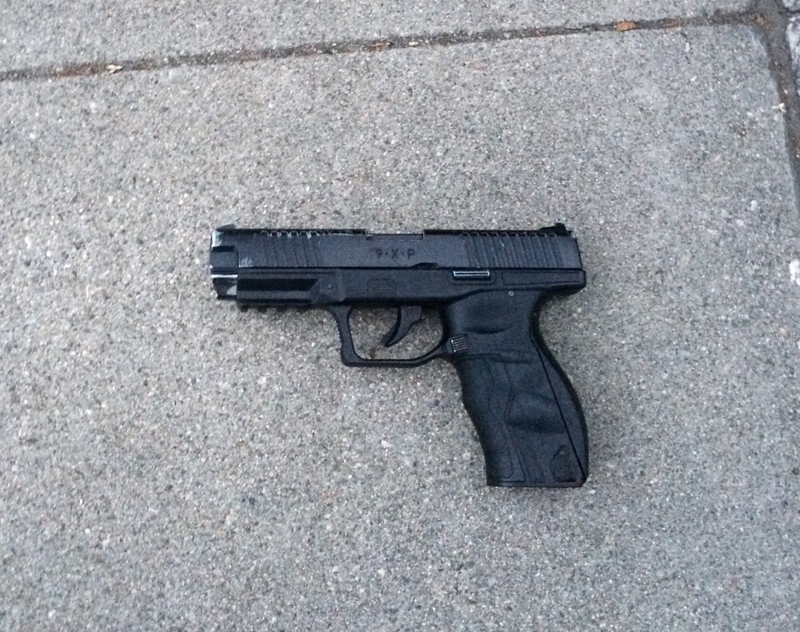 Detectives recovered a gun believed used by the suspect. Montebello police said no officers were injured in the shooting that took place in the 2900 block of West Via Corona, just west of Garfield Avenue, at 2:23 p.m.
Montebello police and an agent with the Bureau of Alcohol, Tobacco, Firearms and Explosives went searching for 26-year-old Christopher Diaz based on information that he was in an apartment, according to Sheriff’s Homicide Bureau Lt. Derrick Alfred. Officers saw Diaz leave the apartment and get into a silver compact sport utility vehicle driven by someone else, he said. The officers followed the SUV and tried to pull it over in the parking lot of the Super A Foods store at 2924 W. Beverly Blvd. in Montebello. Alfred said Diaz got out of the SUV and ran, followed by two Montebello officers and the ATF agent. The driver fled the scene. Alfred said Diaz ran down West Via Corona, darted between two houses and tried to jump over a fence. Diaz allegedly pulled a gun. “The suspect turned around, pointed a gun and fired at least one shot,” Alfred said. It wasn’t clear if one officer or all three returned fire. Diaz was hit once in the torso and died at the scene. Diaz is the prime suspect in the Aug. 6 fatal shooting of Roxann Acosta, 28, of Alhambra in the 1200 block of West Victoria Ave. in Montebello. Montebello police said the two argued while at the apartment of Diaz’s mother that night. Witnesses told police Diaz shot Acosta then left the apartment. Acosta died at the scene. Donna Arambula, who is Acosta’s aunt, found out about Friday’s officer-involved shooting. “I don’t wish nobody death. I’m glad this animal was finally off the street,” Arambula said in an email to this publication. Detectives want to talk to the woman who gave Diaz a ride Friday. She is not deemed a suspect, Alfred said. Sheriff’s homicide detectives are investigating the officer-involved shooting. Anyone with information is asked to call the sheriff’s Homicide Bureau at 323-890-5500. Tips may also be submitted anonymously to L.A. Regional Crime Stoppers at 800-222-8477. MONTEBELLO >> Police shot and killed a woman they say drove a car toward an officer and her boyfriend as police were investigating a report of a domestic dispute at a motel in Montebello on Saturday afternoon. The fatal officer-involved shooting unfolded just after 4 p.m. outside the Quality Inn & Suites, 7709 Telegraph Road, Los Angeles County sheriff’s officials said. Police were summoned to the pool area of the motel regarding a dispute between a woman and her boyfriend, both 28 years old, according to Deputy Kelvin Moody of the sheriff’s Information Bureau. The couple, who were using the pool at the motel but were not guests, had been “drinking heavily during the day,” Moody said in a written statement. “A verbal argument escalated to the point where the woman went inside the motel lobby and told the front desk clerk that her boyfriend had taken her purse,” Moody said. Motel staff called the police. The woman then returned to her boyfriend and assaulted him, he said. She drove off just as a Montebello police officer was arriving. “As the suspect drives away, she makes a U-turn and drives towards the officer and the boyfriend with her car, at which time an officer-involved shooting occurred,” Moody said. The woman’s name was not available Sunday pending positive identification and notification of family, Los Angeles County Department of Medical Examiner-Coroner Investigator Rudy Molano said. MONTEBELLO >> Police shot and wounded a man in Montebello on Saturday afternoon, officials said. Few details were initially available regarding the officer-involved shooting, which took place about 4:05 p.m. in a commercial neighborhood in the 7700 block of Telegraph Road, according to Deputy Ryan Rouzan of the Los Angeles County sheriff’s Information Bureau. “The suspect was struck by gunfire,” Rouzan said in a written statement. Detectives from the sheriff’s Homicide Bureau are spearheading the investigation, as is common practice for officer-involved shooting involving Los Angeles County police agencies. ARCADIA >> Prosecutors have filed charges against a teenagers accused of attacking and trying to rob an off-duty U.S. Customs and Border Protection officer in Arcadia before the agent shot two of the suspects, killing one, authorities said Thursday. The encounter took place about 8:15 p.m. on Friday in the area of First Street and Colorado Avenue, just after the off-duty officer and the three suspects all exited a Metro Gold Line train, according to Lt. John Corina of the Los Angeles County sheriff’s Homicide Bureau. Darrius Smith, 15, of Pasadena died at a hospital following the shooting, according to sheriff’s and coroner’s officials. He allegedly pointed what was later determined to be a “realistic-looking” replica handgun at the agent during the incident, Deputy Juanita Navarro-Suarez of the sheriff’s Information Bureau said in a written statement. A 14-year-old suspect was wounded by the gunfire and taken into custody, and a second 15-year-old suspect was arrested in the area uninjured. Prosecutors filed criminal charges of attempted robbery and assault with a deadly weapon against the 15-year-old suspect on Wednesday, Los Angeles County District Attorney’s Office spokesman Greg Risling said. Charges had not been filed against the wounded 14-year-old suspect, who remained hospitalized on Thursday, despite a statement from the sheriff’s department reporting that he, too, had been charged. Their identities have not been released due to their ages. “Although charges have been filed, the Los Angeles County Sheriff’s Department Homicide Detectives are continuing their investigation into the circumstances surrounding the officer-involved shooting,” Navarro-Suarez said. The 15-year-old suspect appeared at an arraignment hearing Thursday and denied the charges, Risling said. He was scheduled to return to court for another hearing on June 15. Sheriff’s officials announced that both surviving suspects had been charged, but Risling said that only the elder of the two teens had been charged. As the investigation, spearheaded by the sheriff’s Homicide Bureau, continued in the days that followed, investigators spoke with witnesses, the suspects and the alleged victim, as well as reviewed evidence collected at the scene and autopsy results, Navarro-Suarez said. Sheriff’s investigators allege the three suspects came up from behind the agent before one of them began punching him in the head, Corina said. The three teens surrounded the agent, the lieutenant said. Darrius Smith, 15, of Pasadena, allegedly pointed what was later determined to be a “realistic-looking” replica handgun at the agent and demanded his property, the lieutenant said. Portions of the incident were recorded by area surveillance cameras, officials said. Sheriff’s officials declined to release any of the footage, but said on Thursday that it supported the account of an attempted robbery gone awry. Surveillance video obtained from the Metro Gold Line shows the off-duty CBP officer and the three teens riding on a train. “The victim exited the train at the Arcadia Station and walked north on First Avenue from the train station, followed by the subjects. Video shows the subjects running up on the victim where the robbery and shooting occurred,” Navarro-Suarez said. Smith was taken to an area hospital, where he succumbed to his wounds. An autopsy carried out Wedbesday by the Los Angeles County Department of Coroner “documented and confirmed” Smith’s injuries, Navarro-Suarez said. But sheriff’s investigators placed a “security hold” on the case, preventing coroner’s officials from releasing information or documents related to the death. The wounded 14-year-old suspect remained at the scene, Navarro-Suarez said. The off-duty CBP officer held him at gunpoint until local police arrived, took him into custody and took him to a hospital for treatment. The off-duty officer was treated for “soft tissue damage” to the side of his head, Navarro-Suarez said. His identity has not been released. An attorney representing Smith’s family and civil rights activists disputed the official account, alleging that Smith was first shot in the legs before standing over him and shooting him in the chest. It was also alleged that the officer chased after Smith at some point. Sheriff’s officials said the video showed the off-duty officer did not chase after Smith. 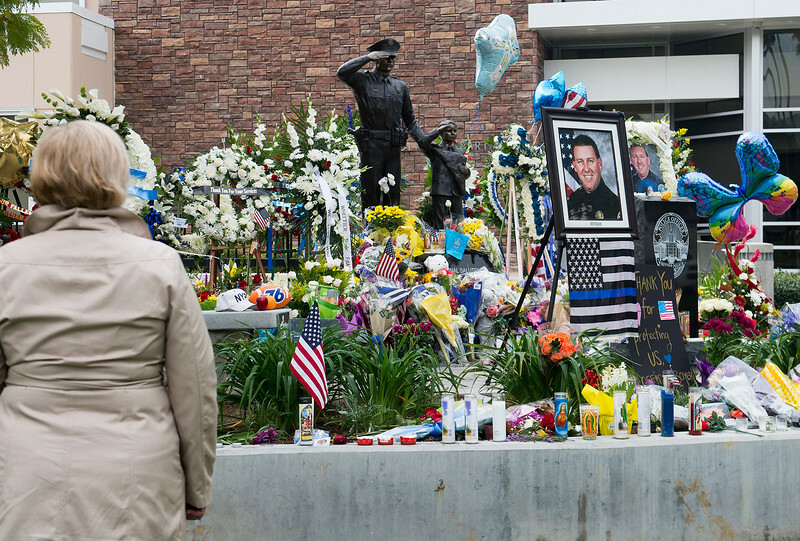 “Surveillance footage shows that the officer never left the scene of the shooting, nor did he run after subject Smith onto Colorado Boulevard following the initial encounter and shooting,” Navarro-Suarez said. “The manufacturer of the gun boasts on its website that they are the masters of look-alike air guns and that their replica guns are realistic looking,” she added. Anyone with information is asked to contact the sheriff’s Homicide Bureau at 323-890-5500. Tips may also be submitted anonymously online to L.A. Regional Crime Stoppers at 800-222-8477. ARCADIA >> An off-duty U.S. Customs and Border Protection agent shot two teenagers, killing one, after the boys allegedly attacked and tried to rob him in Arcadia late Friday, officials said. The shooting took place about 8:15 p.m. in the area of Colorado Boulevard and 1st Avenue, Deputy Caroline Rodriguez of the Los Angeles County sheriff’s Information Bureau said. The off-duty federal agent was walking down the sidewalk when three teenage boys attacked him from behind, she said in a written statement issued Sunday morning. The suspect brandishing the handgun, a 15-year-old boy, as well as a second 14-year-old suspect were struck, officials said. The third teen, 14, ran away. Both wounded teens were taken to an area hospital. The 15-year-old suspect succumbed to his injuries just after 5:30 a.m. Saturday morning, Deputy Guillermina Saldana said. His identity was not available. The wounded 14-year-old remained hospitalized with injuries described as non-life-threatening, Saldana said. “The victim had some bruising to his face which did not require medical treatment,” Rodriguez said. Police soon found the third suspect at a nearby home. He was booked on suspicion of robbery at Central Juvenile Hall in Los Angeles. “The subject’s handgun was recovered at the scene,” Rodriguez said. Arcadia police Lt. Vaughn Whalen declined to discuss the incident. U.S. Customs and Border Protection officials could not be reached for comment Saturday. The investigation is being led by detectives from the sheriff’s Homicide Bureau. Anyone with information is urged to contact the sheriff’s Homicide Bureau at 323-890-5500. Tips may also be submitted anonymously to L.A. Regional Crime Stoppers at 800-222-8477. VALINDA >> A deputy fired a weapon, but no one was injured, while arresting three gang members on Sunday, officials said. 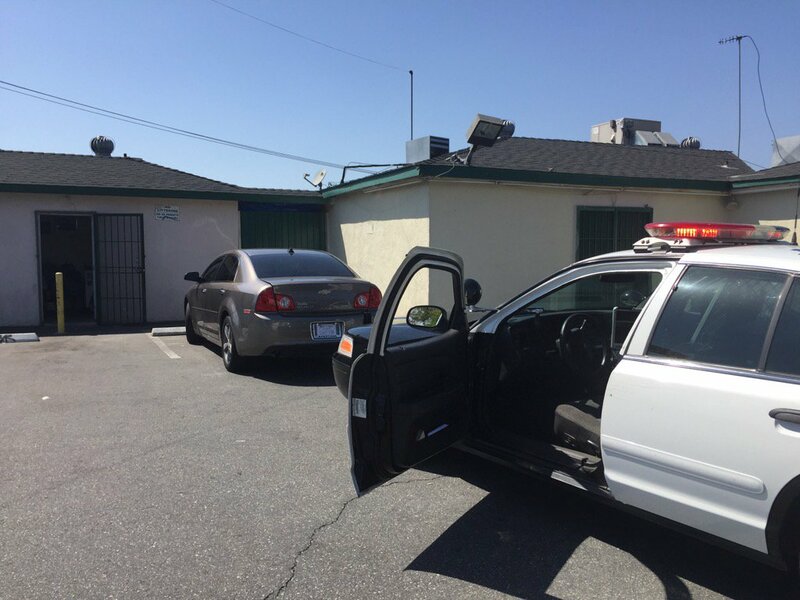 The incident unfolded just after 1 p.m. at Maplegrove Street and Aileron Avenue, Deputy Juanita Navarro-Suarez of the Los Angeles County Sheriff’s Department Information Bureau said in written statement. No injuries were reported, and three male suspects were being detained as the investigation continued Sunday afternoon. In a post on Twitter, Capt. Tim Murakami of the sheriff’s Industry Station described the three suspects as armed gang members. PASADENA >> A Pasadena gang member accused of shooting at a police officer before being wounded himself and arrested pleaded guilty to three felony charges in connection with the incident, authorities said Wednesday. Francisco Flores, 23, pleaded guilty Tuesday to charges of assault on a peace officer with a firearm, discharging a firearm during the commission of a felony and possession of methamphetamine while armed with a handgun, with allegations the crimes gang-related, Pasadena police officials said in a written statement. He’s expected to be sentenced to 35 years in prison when he returns to Los Angeles County Superior Court for sentencing on March 17. He was a passenger in a car two officers tried to pull over about 9:15 a.m. on April 8, 2016, at Buckeye Street and Los Robles Avenue. The car came to an abrupt stop at Buckeye Street and Adena Avenue, where Flores ran from the vehicle. The officer returned fire, striking Flores, police said. Flores was treated for his wounds and has since recovered. Flores was already out on bail pending an illegal gun possession case at the time of the shooting, officials said. 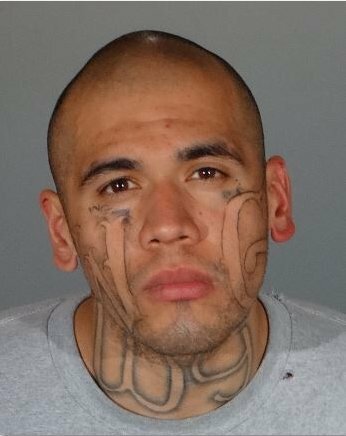 WHITTIER >> The gang member accused of killing a Whittier police officer and another man on Monday, as well as wounding another police officer, remained hospitalized in a intensive care unit Wednesday as detectives continued gathering evidence and the community continued mourning and seeking answers. 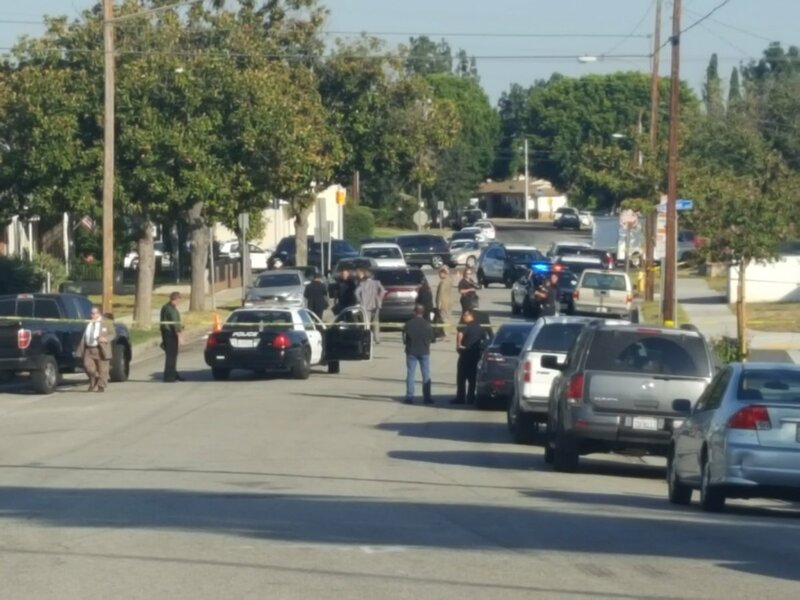 Investigators were yet to interview Michael Christopher Mejia, 26, of Los Angeles, as he continued receiving treatment for a gunshot wound to the back sustained in Monday morning’s gunfight with the Whittier, Lt. John Corina of the Los Angeles County Sheriff’s Department Homicide Bureau said. His injuries were not considered life-threatening. The tight-knit Whittier community has rallied around the family of Officer Keith Boyer, a 53-year-old Whittier resident, 28-year lawman, father, grandfather and classic rock drummer. Officer Patrick Hazell, who was wounded in the abdomen in the shootout, was released from the hospital and continuing his recovery at home, Corina said. His father said the wounded officer did not wish to comment at this time. Mejia, a documented gang member who was on felony probation, or “Post-Release Community Supervision,” under the terms of AB 109, is also accused of gunning down his cousin about 5:30 a.m. in the 1400 block of Volney Drive in East Los Angeles, less than three hours before the violent encounter with police in Whittier. Family members said Mejia showed up the Torres home and confronted Torres inside the converted garage the victim used as his bedroom. The men possibly became involved in an argument prior to the shooting, relatives said. Following the shooting, Mejia allegedly fled in Torres car, which he soon crashed in Whittier. An autopsy determined Torres died from a single gunshot wound to the head, Los Angeles County Department of Medical Examiner-Coroner Assistant Chief of Operations Ed Winter said. The death was ruled a homicide. 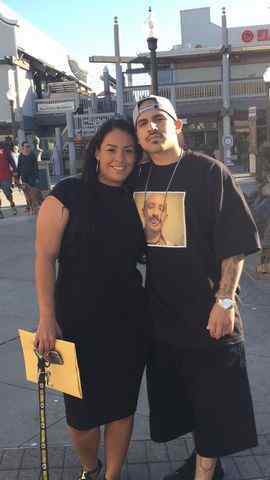 No further details of the East Los Angeles slaying, including a motive, have not been released.Mejia was driving a stolen car when became involved in a minor crash with two other vehicles at Colima Road and Mar Vista Avenue about 8 a.m., Corina said. Police arrive at the scene after the other drivers had helped Mejia push the car he was driving to the side of the road. “They asked him to get out of the car. That’s when the shooting occurred,” Corina said. Mejia suddenly drew a semi-automatic handgun and opened fire, striking both officers. One of the officer managed to return fire and wound Mejia, who was taken into custody at the scene by fellow officers, officials said. It was unclear which of the officers wounded the suspect. Corina declined to discuss whether one, or both, of the officers fired their weapons. Mejia’s gun was recovered at the scene, Corina said. The involved officers were not wearing body camera, and Corina said he was not aware of any video recordings of the deadly encounter between Mejia and Whittier police. Mejia was expected to be charged in connection with the case once he’s out of the hospital, the lieutenant said. Mejia had prior convictions for robbery, and most recently, auto theft, officials said. He as been re-arrested for probation violations five times since being released from prison for the auto theft conviction, each time resulting in 9- or 10-day “flash incarcerations,” under the terms of AB 109, also known as the “California Public Safety Realignment” of 2011, records show. Details regarding the circumstances of each arrest were not available, however none resulted in the filing of a new criminal case. At least one of the arrests was for possession of methamphetamine, Corina said. Possession of methamphetamine had traditionally been a felony in California, punishable by a year or more in prison, but was reduced to a misdemeanor by Proposition 47, passed by California voters in 2014. Mejia’s criminal record has raised concerns of law enforcement officers, politicians and others, who are questioning whether Mejia should have been behind bars, rather than out on the street, on Monday. A documented gang member, and an apparently proud one, Mejia bears the letters “W” and “G” tattooed prominently across his face in capital letters. The same abbreviation, which stands for an East Los Angeles street gang, is also tattooed on Mejia’s neck in lower-case letters. Services for Boyer have not been announced. The Whittier Police Department is accepting donations to benefit Boyer’s family. He’s survived by a fiancee, four children and two grandchildren. Checks can be made out to “WPOA Benevolent Fund,” and reference account No. 488879. Contributions can be dropped off in person at the Whittier Police Department, 13200 Penn Street, in person at the Credit Union of Southern California at 8028 Greenleaf Ave. or mailed to the Credit Union of Southern California, WPOA Benevolent Fund, attention David Valencia, PO Box 200, Whittier, CA 90608. Any witnesses, or anyone with information, regarding Monday’s incident is encouraged to contact the sheriff’s Homicide Bureau at 323-890-5500. AZUSA >> Police shot and killed a man in Azusa late Sunday, authorities said. The fatal officer-involved shooting took place at 11:21 p.m. in a residential neighborhood in the 200 block of Windsong Court, Deputy Jeffrey Gordon of the Los Angeles County sheriff’s Information Bureau said in a written statement. The suspect, described only as a man, died at the scene, Gordon said. The sheriff’s Homicide Bureau is spearheading the investigation.